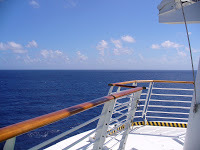 Our Caribbean cruise started from Port Everglades on Saturday so, we flew to Fort Lauderdale on Friday. This was a crafters group cruise for Georgia (husbands were invite to tag along) and we were meeting up with some of the others from the Klik n’ Kut group on Friday night. Our cab was due to pick us up at 9:30 AM but, before that, I had to shovel snow from the driveway. I was ready for some warm weather! We got to the airport in plenty of time. Way more time than we needed since, as usual, the flight was late. The aircraft was late arriving from Phoenix and, a mechanical problem with the airplane kept us in the terminal an extra 45 minutes. Then, when we did get on board, the ground support personnel couldn’t get the tug started to push us back from the gate. We had to wait another 20 minutes while they located another one that would start. Finally, we got going and had a smooth flight to Fort Lauderdale. The captain made up some time so we arrived just an hour later than planned. We caught a shuttle to our hotel, checked in and signed up for a shuttle to the port the next afternoon. We had a little time to get settled into our room before meeting the other members of the group who had also arrived a day early. This is an online group of die cutter users so, Georgia had not met them face-to-face before this. We all walked across the street to Ernie’s Bar-B-Que for a get acquainted dinner. Since we were a little late getting in the day before, the earliest cruise port shuttle we could get was 3 PM. We decided not to wait and grabbed a cab for the short and inexpensive, ride. That was a good move since it put us ahead of most arrivals. There was no line for check in so, we were on board the ship Navigator of the Seas before noon. We couldn’t go to our cabin until 1 PM but we could get lunch at the Windjammer Cafe on deck 11. Again, we met up with others from the group as they were arriving. Then, down to the cabin to look it over. After choosing balcony cabins for our other cruises, we picked a promenade view for this trip. I sort of missed being able to step outside but, looking over the Royal Promenade was fun. I did spend a lot of time on the open deck too though. Once the ship sailed, Georgia went off to the first group session while I looked over the ship. We all got together again for dinner in the Coppelia dinning room at 8:30. 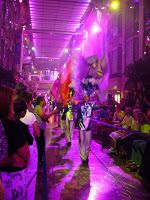 Later Georgia and I watched the Bon Voyage parade on the Royal Promenade before returning to our cabin for some much needed sleep. Georgia had classes and seminars all day so, I attended the port talk in the morning then explored the ship from top to bottom, bow to stern. I had a quick lunch at the Windjammer and spent most of the afternoon out on the deck just watching the ocean go by. For much of the time, I could see the coast of Cuba in the distance. After Georgia’s last session of the day, we went to the ice show at Center Ice before getting dressed for our only formal dinner night. We started early so we could have some pictures taken by the staff photographers before dinner. We chose a 4X4 tour of Saint Ann Parish for our Jamaica stop. Our driver, Garry, took us through the Jamaican rainforest in Fern Gully to Murphy Hill where we had a panoramic view of Ocho Rios and the Blue Mountains. The road then wound through some small villages and over a muddy “track” to one of Jamaica’s largest working cattle ranches for a fruit and rum punch break. Then we returned to the coast and on to Dunn’s River Falls. The main activity here is climbing the falls but, I opted to take pictures of the participants rather than climbing myself. Back on the ship for dinner with the rest of the group and then to the cabin to rest up for Grand Cayman. This was our second visit to Grand Cayman. We were here on a cruise a couple years ago and did the island tour and swimming with the stingrays. 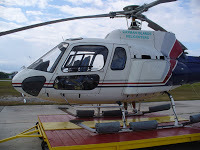 This time, the tour we chose was a helicopter ride over the island. We got on one of the first tenders and, once we were on shore, found the van that would take us to the airport. Once there, a golf cart whisked us out to the pad. Ours was the first tour of the day so, the Eurocopter 350 B2 was still on it’s trailer. It holds 5 passengers and a pilot so that’s how many were aboard. It is a little tight with a full load but, it is a great view. 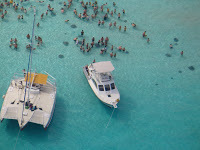 We took off and flew over the town to Stingray City where we could see the rays swimming around the people in the water. We over flew a couple other reefs while the pilot demonstrated the maneuverability of the aircraft with some steep turns and hovering flight. Then we went back over the city of George Town and down the length of Seven Mile Beach. Finally, we circled the five cruise ships anchored on the harbor before landing back at the airport. This was the first helicopter ride for both of us and it was a thrill. The day wasn’t over yet though. Back on the ship, we had reservations for dinner at Chops Grill, one of the Navigator’s premium dining options. After our quiet dinner for two, we made our way to the Metropolis Theatre for the evening show. It was a full day and we were ready for a good nights sleep. Tomorrow would be the last full day of the cruise and another sea day. Was the guy with the donkey at the falls selling pictures? I took a picture of him and his 4 leg friend and he went balistic wanting to confiscate my camera. I explained that he and his donkey needed to step away before we had a problem….only on vacation. Gald you both enjoyed a break from the winter wx. L>ooking forward to Part II. Nope, we didn’t see the anyone with a donkey there. Just a couple singers who wanted money for taking their picture.